Once upon a time there was a village. There were cottages and homes surrounding the vibrant life of community. People came and went connecting to neighbors sharing a wave, smile and gossip. Families for several generations stayed in the same large home and neighbors searching for friends gathered on front porches for coffee or tea and lively fun. Backyards were gathering spots for everyone to join in for barbecues around the neighborhood. Then one day the auto was invented and grew in influence. Soon cars were carrying people further out of the city to homes further apart and homes grew larger in size. So, people drive for thirty minutes enter a subdivision with windows rolled up never waving to a neighbor. They drive into the garage and the garage door goes down. To go outside they step out the back door to a fenced in backyard. They stay in large homes because the larger the home the longer you stay in it. The smaller the home the more you go outside to meet your neighbor. Modern housing is designed for isolation. And here's the kicker, research now shows the loss of neighborly connection can be measured in ill health and dysfunctional lifestyles and is a contributing factor for increased disease and the break down of culture. To live a vibrant, healthy life it takes a village. It takes homes designed for connection, clustered around courtyards, envisioned with community in mind. It takes an intention and commitment. The need in Nashville is great for homes that offer built in social connections for sustainable living. A new village concept has come to Nashville to meet this changing need. Sign up now for the newsletter and receive a free booklet about these unique types of communities. 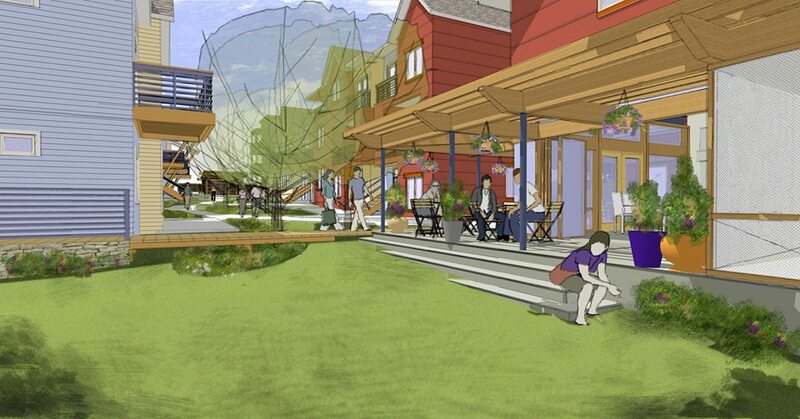 Written by a conservation architect who designs conservation and cohousing communities. This is an introduction to understand new possibilities. And whether it's condos, single family homes or apartments in the urban, suburban or rural areas the design for community and a sense of place is the same. The first community to start was Germantown Commons, an urban cohousing community in the Germantown area that provides 25 condos (individually owned) and a common house for regular dinner parties of the community. The design sets the stage for great social interaction and fun in the community. This community of residents initiated and mostly funded their development and it was nearly sold out before construction ever got underway. 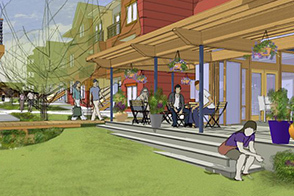 Cohousing is great for young families who need a support system of neighbors who care. Crime is non existent in cohousing with families of between 15 and 35 households providing a safe, fun environment for children. The community environment also serves the baby boomer, the aging and single individuals providing built in connections and opportunities to naturally contribute in a whole community experience. An urban option is only one of many types of housing that can be designed for healthy, vibrant community and walkable to resources. Conservation communities are another, designed and built to include; cohousing, hamlets, or village groupings. They are designed to return communities back to times of healthier, vibrant connections needed for psychological and economic well being. A complete village can provide a more vibrant lifestyle; good neighbors, economic opportunities, organic food on site, built in play dates for children, opportunities for all to contribute. Collaborative consumption is an opportunity for sharing and increasing resources that raises the standard of living for everyone involved. 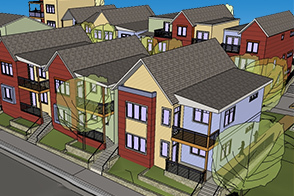 New communities are being envisioned around Nashville. Join the vision and build a new lifestyle with housing designed to create connections along with individual independence and privacy. These are cottage homes, garden homes and conservation communities all with a priority for stronger community; a lifestyle of collaboration and contribution. Where personal well being is at the heart of community design. As traffic increases in the Middle Tennessee region pushing you to spend more time with your windshield, finding a sustainable community will increase in importance to have local resources nearby and neighbors with a sense of place. The time to find your new home with community is now. options taken from the traditional village life. Receive occasional updates as the communities form. You will only receive the emails that you permit.